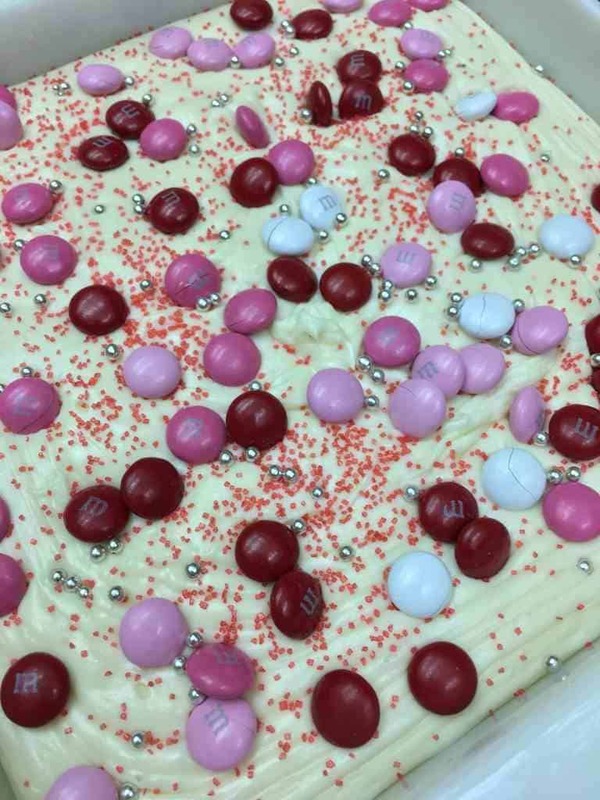 We love Valentine’s Day around here. Mainly because there is going to chocolate involved. Both of my kids are in middle school now, so gone are the days of sitting around the table and writing out Valentine’s for all the other kids in class. Didn’t you love those parties? John and Ethan would sit at the kitchen table and write out their cards, cross the names off of the class list, and get them ready to take to school. On occasion, they would decorate a Valentine’s box to keep all of their cards in. I always tried to volunteer at the school on party days. 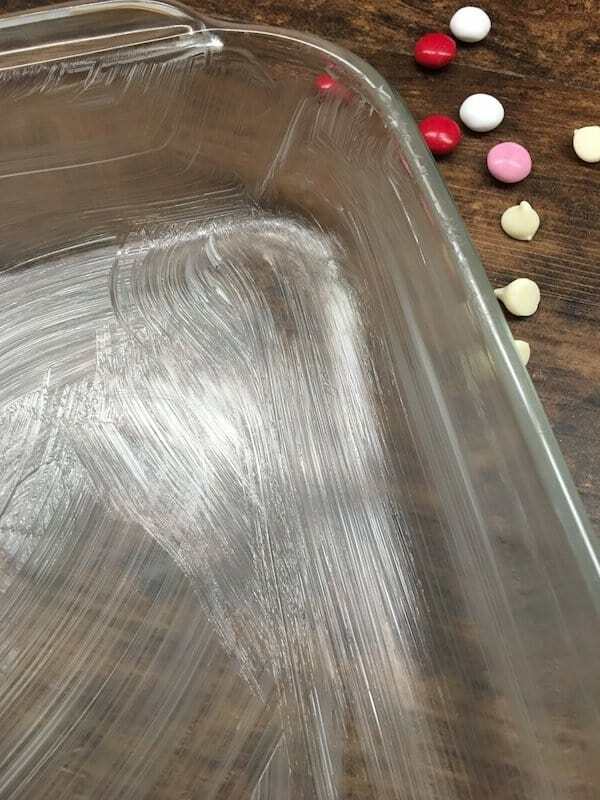 Watching the kids open their treats and get so excited over Valentine’s Day cards made the day so much fun. What did your kids do for the holiday? Do you have a special tradition? What is your favorite Valentine’s Day memory? 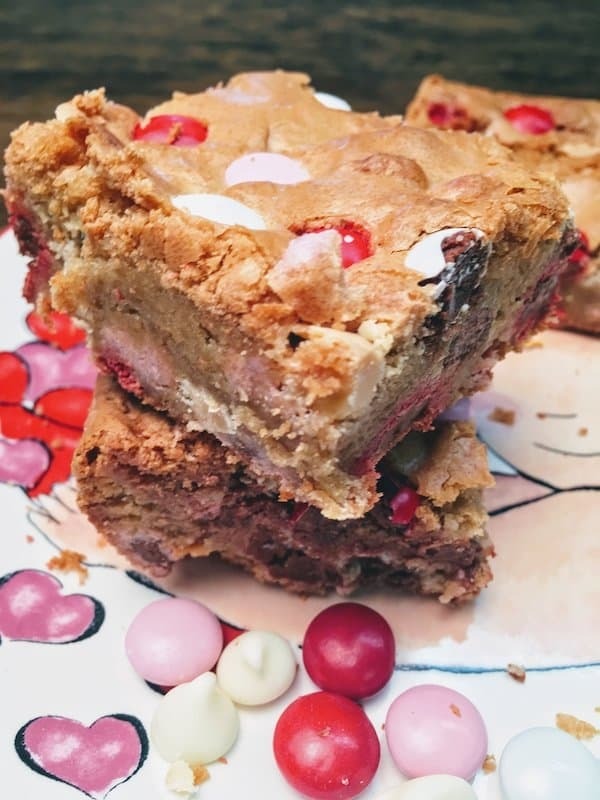 We started making treats here at home, and blondies are a hit. Plus, they are super easy to make. Recipe and printable instructions listed at the bottom. This recipe starts out with melted butter. Such a good start. Add the brown sugar, eggs, and vanilla. 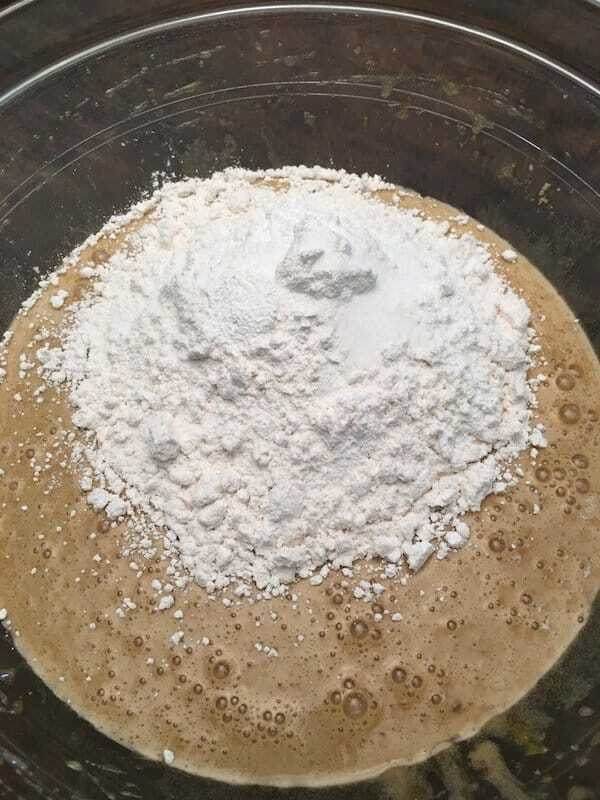 Once you stir things up, add the flour, baking powder, and salt and mix it again. 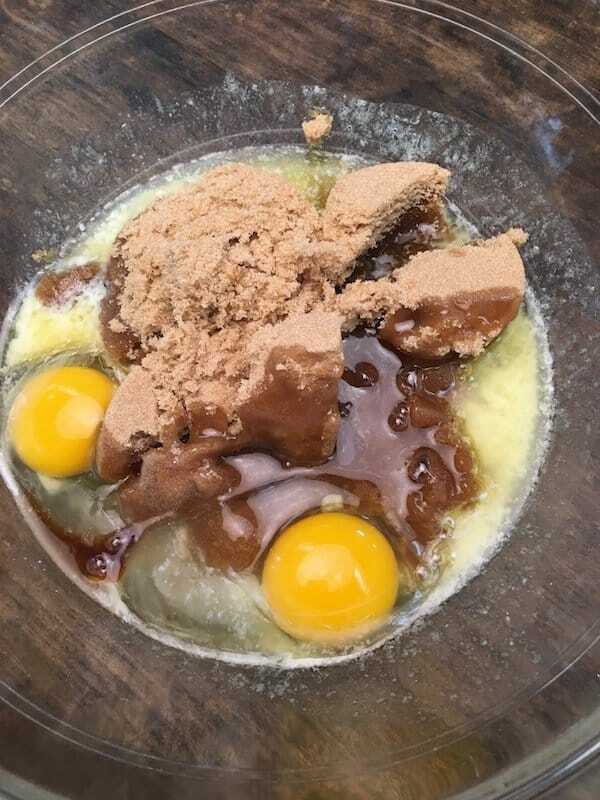 Add the chocolate candies. You can either use M&Ms or use regular candies. We have a Bulk Nation nearby and I picked out some Valentine chocolate candies to use. I had some white chocolate chips at home. It was tough not to eat too many before they went in the batter. Don’t you love the colors? Give everything a good stir with your spatula one more time. And, more butter! Grease the pan so nothing will stick. 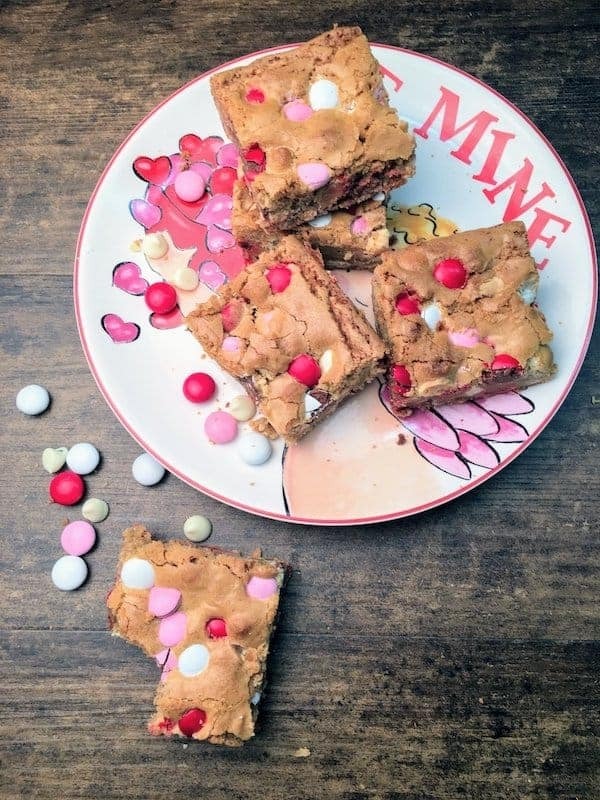 Once the batter is in the casserole dish, I sprinkle a few more candies over the top so the Valentine blondies come out looking beautiful. Bake at 350-degrees for approximately 20-25 minutes, or until your cake tester comes out clean. If you don’t have a cake tester, you can use a knife. 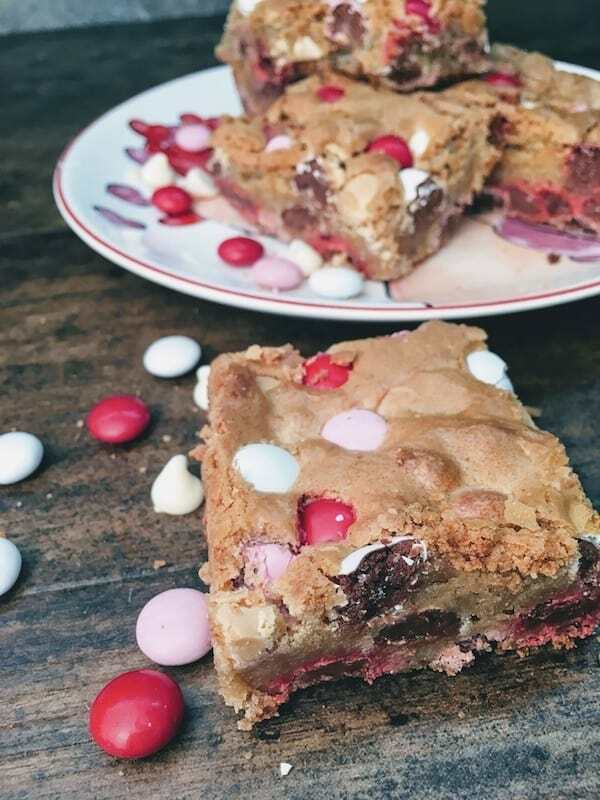 The kids thought the Valentine Blondies tasted like a brownie and they ate them up lickety-split! 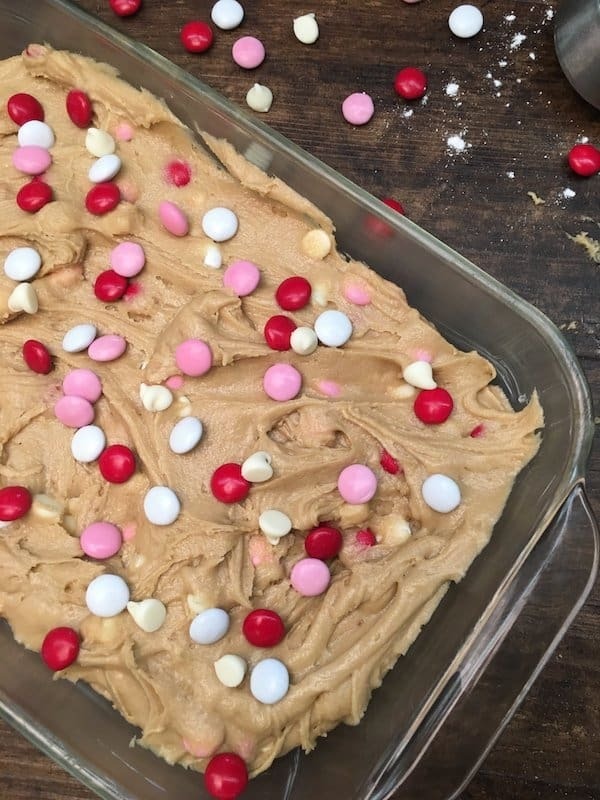 This is a delicious recipe and I know you are going to love it. 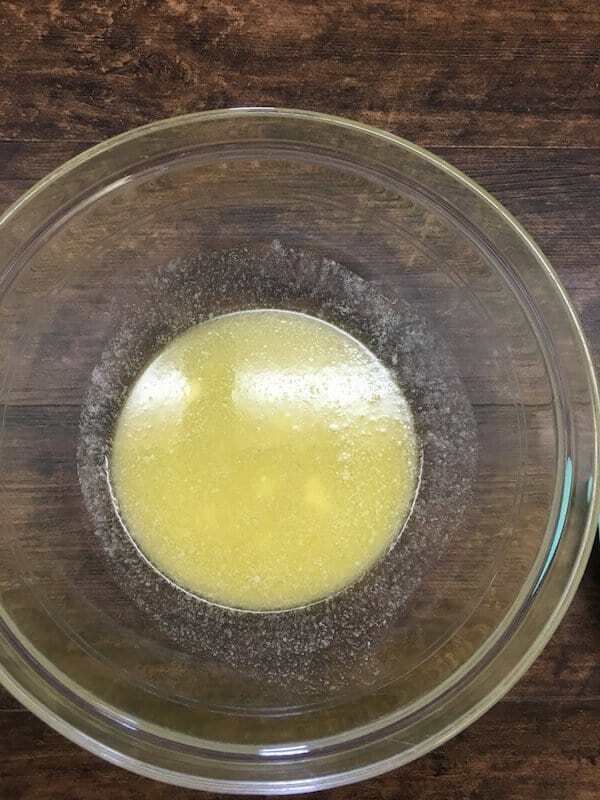 Add the melted butter to a bowl. 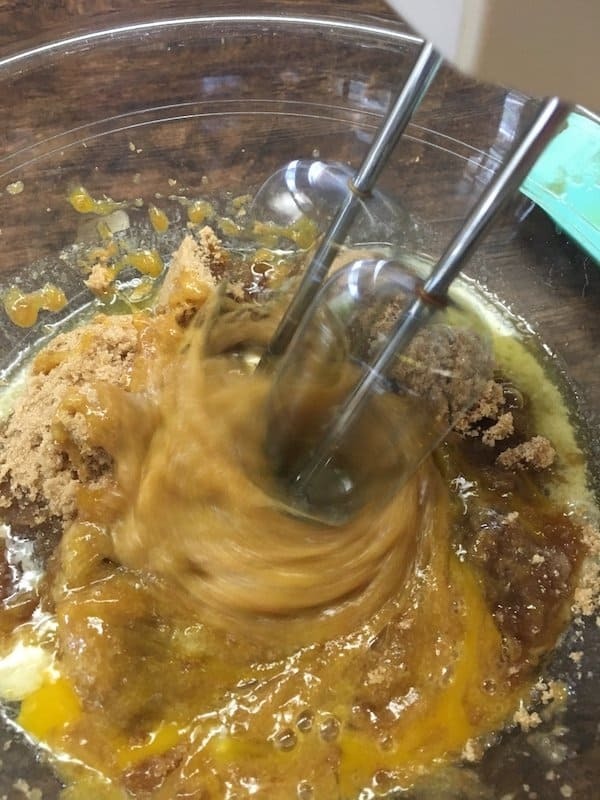 Add the brown sugar, eggs, and vanilla and blend well with a mixer. Add the flour, salt, and baking powder and mix well. 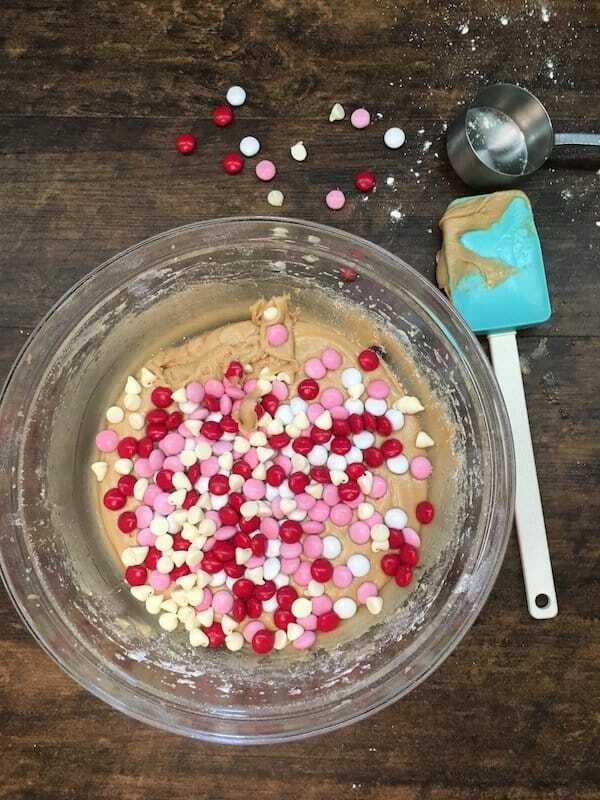 Add the chocolate candies and chocolate chips and mix in with your spatula. Bake for 20-25 minutes or until cake tester comes out clean. 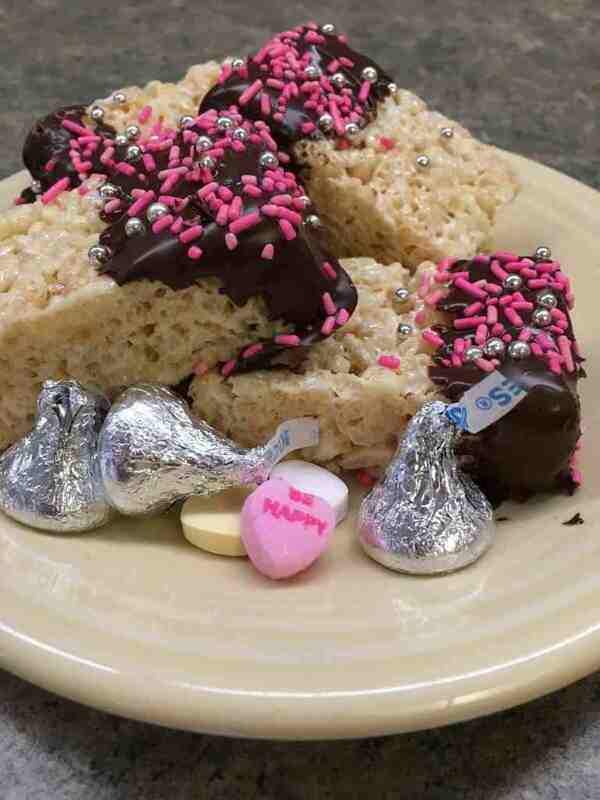 These look like such a great treat for Valentine’s Day! Pinning to my Valentine’s Board. I have fond memories of my children when they were little and the excitement of choosing cards for their classmates. Hi Beverly! Thanks so much for pinning! Isn’t it so great to think back on those sweet memories? Have a good night!